Last week we reported that there's a new Pokémon title coming to Japan on the DS, a crossover title that features Tecmo Koei's Nobunaga's Ambition series. Pokemon Company has now released a two-minute trailer that shows off plenty of the overhead strategy gameplay, along with what appears to be a local multiplayer mode. We've attached the video below, what do you think of it? Doubt it would come to NA, though. Always let the Pokémon do your dirty work, they won't mind. While i expected the battles to also include the warlords it still looks promising. Can't wait to hear about Japanese reviews. Well, as far as Pokemon spin-offs go, this is one of the more interesting ones. Was that Arceus at the end? A pokemon SRPG? You know, if this were released stateside, I'd actually pick it up. 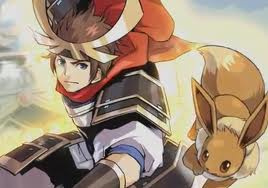 Now that Koei is helping out with this Pokemon cross-over I want a Pokemon Dynasty Warriors game. Just saying. This crossover just looks weird - it doesnt fit. None the less the graphics and gameplay look alright, but I wouldnt buy it anyway if it came out here. Hmm, That looks interesting. But are Pokemon cross overs the right way to take the Pokemon Franchise? Looks kinda odd from any other pokemon game i have seen! nah i'll pass on this one. Stop plugging Gallade and pretending Gardevoir doesn't exist Nintendo! This mix up could work. It would keep the Pokemon games fresh from a gameplay point of view. Well.... I wouldn't pick this up. When I saw the headline a few weeks back, I had assumed that it would be in the Pokemon RPG turn-based style of fighting. This isn't something that appeals to me. If it were a bit more like Pokemon Rumble or Fire Emblem, maybe...so far though...it's a "no" from me. Why would people think this game won't be released in the west? It's a Pokemon game, and Nobunaga's Ambition games have been localised plenty often in the past. It's a good thing. Hopefully it gives Nobunaga's Ambition a boost in popularity, though this game is lite as all hell. @kyuubikid213 - ... more like Fire Emblem you say? Did you watch the video? Fire Emblem is a grid-based strategy rpg, hmmm, so is this game. I also don't see why people don't think it will leave Japan, it's a pokemon game. Very rarely do pokemon games not leave Japan (and in those cases it's stuff like Pikachu Teaches Typing). This wouldn't be as niche as people think. Man, I wish Pokemon Typing DS would come to the US. It would really help my typing speed cause I love Pokemon! I'd buy it just to see Mewtwo get some recognition again..
Nintendo, I have money. Bring this to America. It's Pokemon. It will accidentally sell a million with the name in the title alone. It's not even a remote financial risk. Fire Emblem x Pokemon x obscure Japanese generals game brand? This looks absolutely amazing. I doubt it will be localized, but I will hold out hope that Nintendo sees the cash behind the Pokemon brand! Kyaa~!! Its so cute!! I would love a SRPG Pokemon here. If not I'll just import it like I will with Ni no Kuni for the DS. At first when I heard about it, I thought that it was weird, especially when the first trailer came out with NO game play footage. Now seeing the footage I would buy this game. The question is, will it come over? Who knows. It would cost a lot to localize but as pointed out earlier a million copies would sell just with Pokemon in the title. I look forward to the reviews when it hits Japan. So amazing! I can't wait to get it, it's definately worth getting, even if there's no North American version. I want a pokemon emerald remake for 3ds with trick master and secret bases and all that. I know a person who works for pokemon and said it was comming. DS? Looks like I will be importing this. Interesting game and seems very cool to play. I wonder, if this is at an imperial age, would they still use pokeballs? Oh well, time to catch up on my kanji, katakana, and hiragana. Looks text heavy. I am really excited about this! I hope they release it internationally, esp in Australia haha. Are 3ds region free?